A LETTER from Colonel Jo. Lambert, of the * Day of *, from Bernard Castle, was this Day read. Ordered, That a Letter be written to Lieutenant General Cromwell, to march with all Speed to join with the Forces of Major General Lambert: And that a Copy of Colonel Lambert's Letter, and the Informations therein, be sent to Lieutenant General Cromwell. Mr. Ashurst is to prepare this Letter. Ordered, That a Letter of Thanks, to be signed by Mr. Speaker, be sent to Lieutenant General Cromwell, taking notice of his good Service at Pembroke. Sir John Temple is to prepare this Letter. Ordered, That Colonel Hutchinson do go down into the Country, for the especial Service of the Parliament. A Letter from Nottingham, of 24 Julii 1648, from Francis Pierrepont, and others, was this Day read. Ordered, That an Order be made to the Effect in the said Letter: And that an Ordinance be brought in to that Purpose. A Letter from Sandwich, of Twenty-eighth July 1648, from Sir Michael Levesey, was this Day read. Ordered, That, Sir William Brereton, Thomas Scott Esquire, Mr. John Beauchampe, Mr. John Fenwicke, Major Lewis Audley, Mr. James Jordan, Mr. Thomas Moore, Mr. Edmond Moore, and Captain Riche of Chepsteede, be added to the Committee of Sequestrations for the County of Surrey. Ordered, That the Letters, and Papers, and Commissions, taken by Sir Machaell Livesey, be referred to the Committee where Mr. Leachmore is in the Chair; to peruse the same; and forthwith to make Report of the Effect thereof, and their Opinions thereupon, to the House. Ordered, That Mr. Strickland be added to that Committee. Ordered, That William Dingley, Henry Bromley, John James, Gervase Bucke, Esquires, and Edward Elvins Gentleman, be added to the Committee for Sequestrations for the County and City of Worcester. Mr. Samuell Browne carried to the Lords, for their Concurrence, the Vote for a Treaty with the King in the Isle of Wight: And the Order touching the Exchange of the Earl of Cleveland for Sir Wm. Massam. He brings Answer, That the Lords do agree to both. Ordered, That an Ordinance be brought in, for continuing the Assessment of Sixty thousand Pounds per mensem, for Maintenance of the Lord Fairefax his Army, for Six Months longer, to begin after the Expiration of the Ordinance now in Being. Ordered, That the Report from the Committee for Proportioning of Assessments be made on Thursday Morning next. Ordered, That the Lords Concurrence be desired to the Order for exchanging the Earl of Cleveland for Sir William Masham. Sir Robert Harley reports from the Committee appointed to go to the Common Council of the City of London, touching the Arrears of Assessments due to the Army. Ordered, That it be referred to the Committee at Derby House, to consider, Whether it be sit to add as many Soldiers to the Garison of Leverpool, as will make them up a Thousand Men, and make Provision for them; of that the said Garison be slighted, and made untenable. 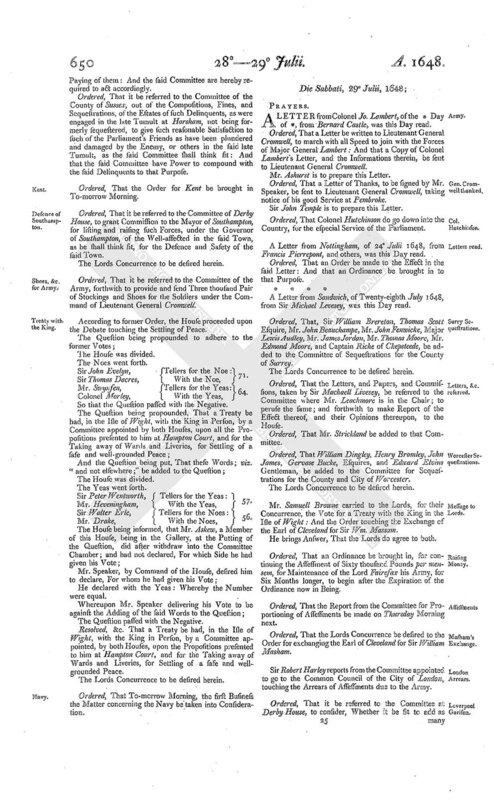 Ordered, That it be referred to the Committee of Lords and Commons for the Treaty with his Majesty, who are to meet on Monday next, in the Afternoon, to consider of all Circumstances touching the said Treaty; and to report the same to the House forthwith. Mr. Wheeler is to carry it up. They were called in: And, after a short Preamble, made by Sheriff Byde, he presented a Petition. Which (after the Petitioners were withdrawn) was read; and was intituled, "The humble Petition of the Lord Mayor, Alaermen, and Commons of the City of London, in Common Council assembled." 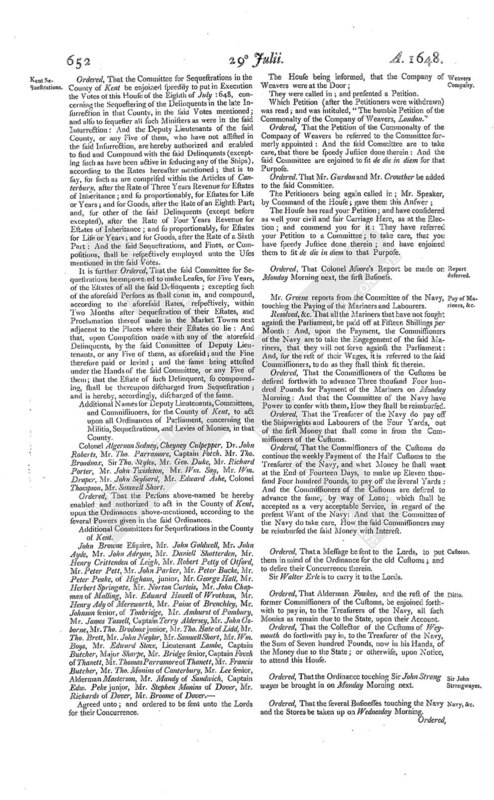 Ordered, That it be referred to the Committee, formerly appointed to go to the City of London; with Power to the said Committee, to represent to them the Dangers of the City and Parliament; and the Grounds and Reasons for making and continuing the Ordinance for listing Soldiers under Major General Skyppon; and with the Informations given to the Parliament. Ordered, That it be referred to the Committee appointed to examine Irregularities in listing Forces; with Power to confer with the Common Council of the City of London, and Militia, and such other Persons as they shall appoint, concerning Irregularities in Listing; and to reconcile the Differences therein; and prevent all Mischiefs that may ensue: And that the said Committee do sit de die in diem. The House has read your Petition; and have considered thereof; and had a sad and serious Debate thereupon: And are sensible of the Respects of the City; and of your Expression, in the latter End of your Petition, of your good Affections and Resolutions: And I am commanded to give you very hearty Thanks for the same: and to let you know that the House hath appointed a Committee to go to the City of London; to acquaint them with the Dangers of the City and Parliament; and with the Grounds and Reasons of making and continuing the Ordinance: And this House have put into a Way of Reforming all Irregularities in listing Soldiers by colour of the said Ordinance. Ordered, That the Lord Mayor of the City of London be desired to call a Common Council to meet on Monday next, at Two of Clock in the Afternoon. Mr. Recorder, or Colonel Venne, are desired to give his Lordship notice hereof. The Lords have commanded us to desire a present Conference, in the Painted Chamber, concerning some Votes, sent from the Lords, touching Recalling of the Ordinance for Major General Skippon, to list, raise, and command Forces in the City of London. Answer returned by the same Messengers; That the House is resolved to give a present Conference, in the Painted Chamber, as is desired concerning the Votes sent from the Lords touching Major General Skippon. That the Committee, formerly appointed concerning a Treaty with the King, may meet on Monday next, Three of Clock in the Afternoon, in the Painted Chamber, to consider of all the Circumstances necessary for the safe and speedy carrying on this Treaty with the King; in particular, That the King may be with Honour, Freedom, and Safety, in such Place in the Isle of Wight, as his Majesty shall make Choice of; and also concerning the Time when the said Treaty shall begin. 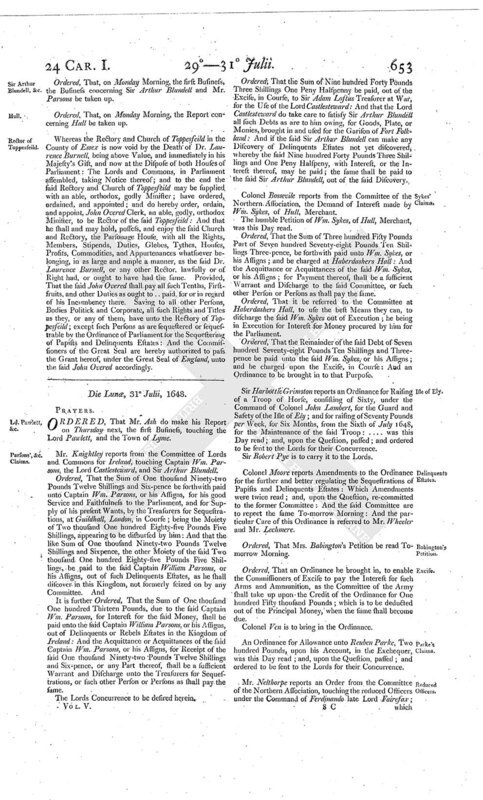 The Lords have returned an Ordinance, concerning the King and Queen's Revenue; with some Alterations; whereunto they desire the Concurrence of this House:-An Ordinance for making John Overed, Clerk, Rector of the Church of Toppesfeild in the County of Essex: An Order, That a Pass be granted, That Monsieur de Montrevell may transport Four Coach Horses, and Eight Saddle Horses, into France: An Order upon the Petition of Henry Maurice, That he have the Place of one Mr. Swetnam, deceased, in the Wine Licence: An Order concerning Mr. Osborne and Mr. Dowsett to have longer Time. They have further commanded us to put you in mind of the Petition of Margarett Roberts and Jane Smith. Ordered, by the Lords and Commons, in Parliament assembled, That the Committee, formerly appointed concerning a Treaty with the King, have Power to consider of all the Circumstances necessary for the safe and speedy carrying on this Treaty with the King; in particular, That the King may be with Honour, Freedom, and Safety, in such Place in the Isle of Wight, as his Majesty shall make Choice of; and also concerning the Time when the said Treaty shall begin. Ordered, That Power be given to the Committee appointed to meet with the Lords, touching a Treaty with the King, to consider of the Safety of the Parliament and Kingdom; and also to consider of a Time, How long the said Treaty shall continue. The Amendments to the Ordinance concerning the King and Queen's Revenue in the North, sent from the Lords, were this Day read; and, upon the Question, assented unto. An Ordinance for making John Overed, Clerk, Rector of the Church of Toppesfeild in the County of Essex, sent from the Lords, was this Day read; and, upon the Question, passed. Ordered, That a Pass be granted to Monsieur de Montrevell to pass into France. Ordered, That the Sum of Twenty Pounds apiece be forthwith paid unto Margarett Roberts and Jane Smith, for their great Pains taken in the Parliament's Service, and their Imprisonment and Dangers sustained thereby: And that the said Forty Pounds be charged at Haberdashers Hall. Answer returned to the Second Message, by the same Messengers; That the House has considered their Lordships Message: And, to the Meeting of the Committee touching the Treaty with the King; and to the Amendments in the Ordinance touching the King and Queen's Revenue; and to the Ordinance for making Mr. Overed, Rector of Toppesfeild in Essex; they do agree: And they have also taken into Consideration the Petitions of Margarett Roberts and Jane Smith: And, to the rest of the Particulars of the Message, this House will send Answer by Messengers of their own. Ordered, That the Lord Clynton, and Mr. Mayne, have Leave to go into the Country. Mr. Prideaux, Mr. Doddridge, Mr. Serjeant Wylde, Mr. Weaver, Sir John Potts, Mr. Boys, are appointed to manage the Conference with the Lords, touching the Votes against Major General Skippon. Ordered, That the Sum of Ten Pounds be given to Cornet Richard Maclaughin, the Messenger from Sir Michaell Levesey: And that the same be charged at Haberdashers Hall. Ordered, That the Committee for Sequestrations in the County of Kent be enjoined speedily to put in Execution the Votes of this House of the Eighth of July 1648, concerning the Sequestering of the Delinquents in the late Insurrection in that County, in the said Votes mentioned; and also to sequester all such Ministers as were in the said Insurrection: And the Deputy Lieutenants of the said County, or any Five of them, who have not assisted in the said Insurrection, are hereby authorized and enabled to find and Compound with the said Delinquents (excepting such as have been active in seducing any of the Ships), according to the Rates hereafter mentioned; that is to say, for such as are comprised within the Articles of Canterbury, after the Rate of Three Years Revenue for Estates of Inheritance; and so proportionably, for Estates for Life or Years; and for Goods, after the Rate of an Eighth Part; and, for other of the said Delinquents (except before excepted), after the Rate of Four Years Revenue for Estates of Inheritance; and so proportionably, for Estates for Life or Years; and for Goods, after the Rate of a Sixth Part: And the said Sequestrations, and Fines, or Compositions, shall be respectively employed unto the Uses mentioned in the said Votes. It is further Ordered, That the said Committee for Sequestrations be empowered to make Leases, for Five Years, of the Estates of all the said Delinquents; excepting such of the aforesaid Persons as shall come in, and compound, according to the aforesaid Rates, respectively, within Two Months after Sequestration of their Estates, and Proclamation thereof made in the Market Towns next adjacent to the Places where their Estates do lie: And that, upon Composition made with any of the aforesaid Delinquents, by the said Committee of Deputy Lieutenants, or any Five of them, as aforesaid; and the Fine therefore paid or levied; and the same being attested under the Hands of the said Committee, or any Five of them; that the Estate of such Delinquent, so compounding, shall be thereupon discharged from Sequestration; and is hereby, accordingly, discharged of the same. 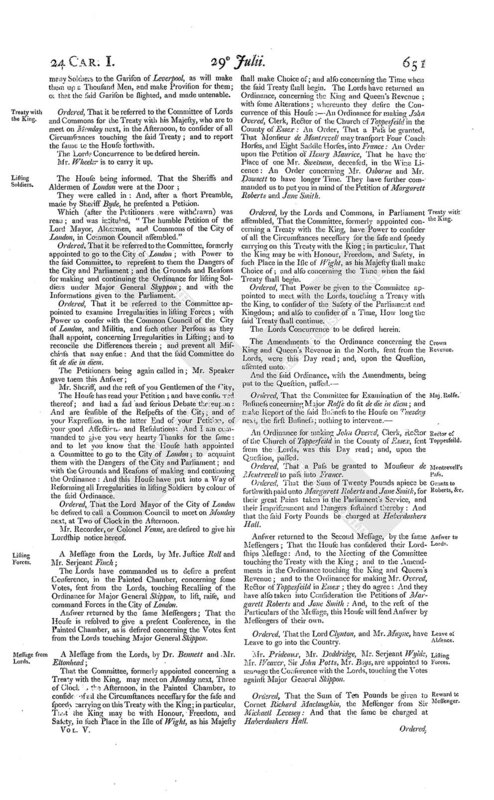 Additional Names for Deputy Lieutenants, Committees, and Commissioners, for the County of Kent, to act upon all Ordinances of Parliament, concerning the Militia, Sequestrations, and Levies of Monies, in that County. Colonel Algernon Sedney, Cheyney Culpepper, Dr. John Roberts, Mr. Tho. Parramore, Captain Fotch. Mr. Tho. Broadnox, Sir Tho. Styles, Mr. Geo. Duke, Mr. Richard Porter, Mr. John Twisleton, Mr. Wm. Say, Mr. Wm. Draper, Mr. John Seyliard, Mr. Edward Ashe, Colonel Thompson, Mr. Samuell Short. Ordered, That the Persons above-named be hereby enabled and authorized to act in the County of Kent, upon the Ordinances above-mentioned, according to the several Powers given in the said Ordinances. Additional Committees for Sequestrations in the County of Kent. Agreed unto; and ordered to be sent unto the Lords for their Concurrence. They were called in; and presented a Petition. Which Petition (after the Petitioners were withdrawn) was read; and was intituled, "The humble Petition of the Commonalty of the Company of Weavers, London." Ordered, That the Petition of the Commonalty of the Company of Weavers be referred to the Committee formerly appointed: And the said Committee are to take care, that there be speedy Justice done therein: And the said Committee are enjoined to sit de die in diem for that Purpose. Ordered, That Mr. Gurdon and Mr. Crowther be added to the said Committee. The House has read your Petition; and have considered as well your civil and fair Carriage Here, as at the Election; and commend you for it: They have referred your Petition to a Committee; to take care, that you have speedy Justice done therein; and have enjoined them to sit de die in diem to that Purpose. Ordered, That Colonel Moore's Report be made on Monday Morning next, the first Business. Mr. Greene reports from the Committee of the Navy, touching the Paying of the Mariners and Labourers. Resolved, &c. That all the Mariners that have not fought against the Parliament, be paid off at Fifteen Shillings per Month: And, upon the Payment, the Commissioners of the Navy are to take the Engagement of the said Mariners, that they will not serve against the Parliament: And, for the rest of their Wages, it is referred to the said Commissioners, to do as they shall think fit therein. Ordered, That the Commissioners of the Customs be desired forthwith to advance Three thousand Four hundred Pounds for Payment of the Mariners on Monday Morning: And that the Committee of the Navy have Power to confer with them, How they shall be reimbursed. Ordered, That the Treasurer of the Navy do pay off the Shipwrights and Labourers of the Four Yards, out of the first Money that shall come in from the Commissioners of the Customs. Ordered, That the Commissioners of the Customs do continue the weekly Payment of the Half Customs to the Treasurer of the Navy, and what Money he shall want at the End of Fourteen Days, to make up Eleven thousand Four hundred Pounds, to pay off the several Yards: And the Commissioners of the Customs are desired to advance the same, by way of Loan; which shall be accepted as a very acceptable Service, in regard of the present Want of the Navy: And that the Committee of the Navy do take care, How the said Commissioners may be reimbursed the said Money with Interest. Ordered, That a Message be sent to the Lords, to put them in mind of the Ordinance for the old Customs; and to desire their Concurrence therein. Sir Walter Erle is to carry it to the Lords. Ordered, That Alderman Fowkes, and the rest of the former Commissioners of the Customs, be enjoined forthwith to pay in, to the Treasurers of the Navy, all such Monies as remain due to the State, upon their Account. Ordered, That the Collector of the Customs of Weymouth do forthwith pay in, to the Treasurer of the Navy, the Sum of Seven hundred Pounds, now in his Hands, of the Money due to the State; or otherwise, upon Notice, to attend this House. Ordered, That the Ordinance touching Sir John Strang wayes be brought in on Monday Morning next. Ordered, That the several Businesses touching the Navy and the Stores be taken up on Wednesday Morning. Ordered, That, on Monday Morning, the first Business, the Business concerning Sir Arthur Blundell and Mr. Parsons be taken up. Ordered, That, on Monday Morning, the Report concerning Hull be taken up. Whereas the Rectory and Church of Toppesfeild in the County of Essex is now void by the Death of Dr.Laurence Burnell, being above Value, and immediately in his Majesty's Gift, and now at the Dispose of both Houses of Parliament: The Lords and Commons, in Parliament assembled, taking Notice thereof; and to the end the said Rectory and Church of Toppesfeild may be supplied with an able, orthodox, godly Minister; have ordered, ordained, and appointed; and do hereby order, ordain, and appoint, John Overed Clerk, an able, godly, orthodox Minister, to be Rector of the said Toppesfeild: And that he shall and may hold, possess, and enjoy the said Church and Rectory, the Parsonage House, with all the Rights, Members, Stipends, Duties, Glebes, Tythes, Houses, Profits, Commodities, and Appurtenances whatsoever belonging, in as large and ample a manner, as the said Dr. Laurence Burnell, or any other Rector, lawfully or of Right had, or ought to have had the same. Provided, That the said John Overed shall pay all such Tenths, Firstfruits, and other Duties as ought to .. paid, for or in regard of his Incumbency there. Saving to all other Persons, Bodies Politick and Corporate, all such Rights and Titles as they, or any of them, have unto the Rectory of Toppesfeild; except such Persons as are sequestered or sequestrable by the Ordinance of Parliament for the Sequestering of Papists and Delinquents Estates: And the Commissioners of the Great Seal are hereby authorized to pass the Grant hereof, under the Great Seal of England, unto the said John Overed accordingly.